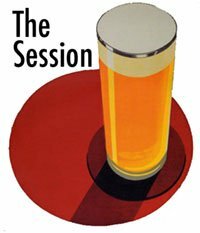 This months Session is hosted by Curtis over at HopHeadSaid. The topic is a simple one, beer collectibles, specifically beer mats (coasters), bottle caps or labels. As you can see, I collect a lot of beer mats. Most are from beers I have had somewhere in the world and taken a few coasters as souvenirs. If Hardknott Dave reads this, he might recognise that shoebox and some of it's contents. There is more to just collecting them though, they are useful and I use them all the time, though I tend to stick to ones I have a lot of. They go perfectly on the bar at home. I have never thought about which one might be my favourite though so I took a quick look and I decided that for me, something that is functional as well as pretty to look at would be what I would have to chose. And so I decided on this rather large one for Kwak*. It has a pretty carriage on the front, but that is not why I picked it. I did not even pick it because due to it's size it is far more efficient in times of spillage. No, the reason I picked it is simply because of what is on the other side. It is very simple and no doubt, The Bosteel brewery are not the only ones to do this but I think it is a brilliant idea. The other side turns this beer mat in to a coaster Postcard. Just imagine, you are in Belgium and experience Belgian beer for the first time. It comes in a bizarre looking glass that should be holding flowers except it is so impractical that you need a wooden stand to keep it from falling over. You flip over your coaster and start writing a postcard to your friend or a family member telling them all about it. It's brilliant! Another good one I assume someone has done is to have lines on the back for you to write tasting notes, perhaps even a quick guide to the cyclops method. I also collect brewery T-Shirts, again because they are functional. I don't collect beer labels or bottle caps, although they do accumulate on the top of the fridge and it looks like I do. Actually if the world of fallout ever comes to pass, I may wish I had hoarded bottle caps. By the way, I am the host of the next session. Stay posted for more info. I will probably write about what I am looking for next week but it is a pretty easy one I think. The title is "Thanks to the big boys". * Can you believe I have never actually had a Kwak to my knowledge. If I did, it was at the end of a long night and I don't remember it. I have had many an opportunity of course, I just did not bother because I have heard it is incredibly sweet, and this is often not to my liking. That said, I certainly will try it the next time I come across it. "The other side turns this beer mat in to a coaster." I think you meant postcard! Well spotted Steve, fixed it. I have to have a Kwak, it's one of those beers I can't believe I have never had before.